What Is B2B IP Tracking? B2B IP tracking is the process of identifying website visitors by performing a ‘reverse IP lookup’ on their IP address and matching this to a company or organization name. It is commonly used by business-to-business (‘B2B’) marketing and sales teams to support direct sales reps with more actionable website-driven leads. What is B2B IP tracking for website-based lead generation? How can Google Analytics help identify B2B website visitors? What are some of Google Analytics’ limitations in this area? What is B2B IP tracking software for web visitor tracking and why might you want it? Who are some of the main software vendors in this product category? How is this related to Account-Based Marketing? 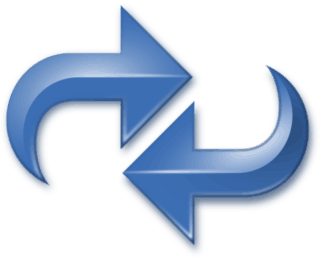 Click above to open a related post on website visitor tracking software. It introduces leading vendors, including core product capabilities and intro videos. In B2B (business-to-business) marketing, delivering actionable leads to sales teams is usually one of the marketing team’s top goals. Inside and outside sales teams need a steady stream of prospects to contact, usually sourced via a combination of sales-driven and marketing-driven efforts to build a prospect base. After all, a sales team without fresh prospects is like a fire without oxygen. It’s in this context that many companies turn to B2B IP tracking tools (also known as website visitor tracking, reverse IP tracking, B2B IP lookup, and B2B IP lead tracking software) to help identify who is visiting the company website and what website content they are consuming. It’s also sometimes referred to as a website ‘Caller ID’ function. I use these terms fairly interchangeably throughout this post. Products such as Leadfeeder, LeadLander, Lead Forensics, CommuniGator, WhoIsVisiting, VisitorTrack (by netFactor), Clickback, Visual Visitor and others have cropped up to answer this need. They all use some variation of the terminology noted above. Click below to skip ahead to the 3rd-party products discussion. Or just keep reading to first learn more about the Google Analytics features that can help identify your website visitors. Typically, only a very small fraction of B2B website visitors contact the company or register for e-newsletters and other content offers. So it’s easy to see why B2B sales teams are eager to reach out more proactively to get a sales conversation started. Armed with better insights into B2B website users, sales staff can engage new prospects in a timely way, moving them more quickly into the sales funnel for qualifying and closing. That’s the theory and the basic sales pitch from the software vendors. What does the term ‘visitor’ mean here, exactly? And… can’t Google Analytics already provide this functionality for free? Right out of the box, Google Analytics (GA) can identify *some* of the organizations visiting your website. We have the Service Provider and Network Domain dimensions in Google Analytics to thank for that. And of course, GA is free for most users, so that’s a big plus too. Where do we find visitor tracking data in GA? The easiest way is to go straight to the Audience >> Technology >> Network report. GA does its own IP lookup to attach the Service Provider and Network Domain dimensions to the user and session data it collects. In many cases, these dimensions appear as specific internet service providers with names we recognize (Verizon, Comcast, ATT, etc., in the US). But, these are not the organizations we’re interested in as B2B marketers and salespeople. These are simply the broadband service providers through which the actual visiting person/company came to reach our website. In essence, the real visiting company and person are masked behind these service providers. 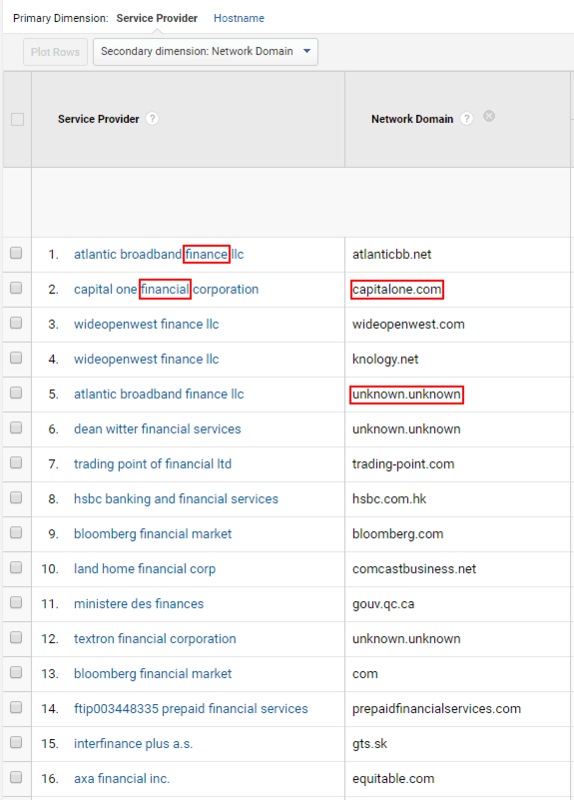 Fortunately, it can be easy to use segmentation and/or report filtering in Google Analytics to zero in on ‘interesting’ names that appear in the Service Provider and/or Network Domain dimensions. For example, suppose you’re a B2B firm marketing to target prospects within the financial services industry. The following example shows the effect of using a GA table filter to include only those Service Provider dimensions that include ‘financ’ as a string (using a RegEx filter). This way the filter picks up ‘finance’, ‘financial’, etc., as shown below. Adding the Network Domain as a secondary dimension can also be helpful and is sometimes useful for filtering as well, as we’ll see below. This dimension can add helpful information, (as in row 2 below for Capital One Financial), or can be fairly useless (as in row 5 for Atlantic Broadband Finance). For a sales team focused on the finance industry vertical, this kind of information, coupled with additional visitor metrics in Google Analytics, can be very insightful. The next example shows the value of being able to filter on the Network Domain dimension. 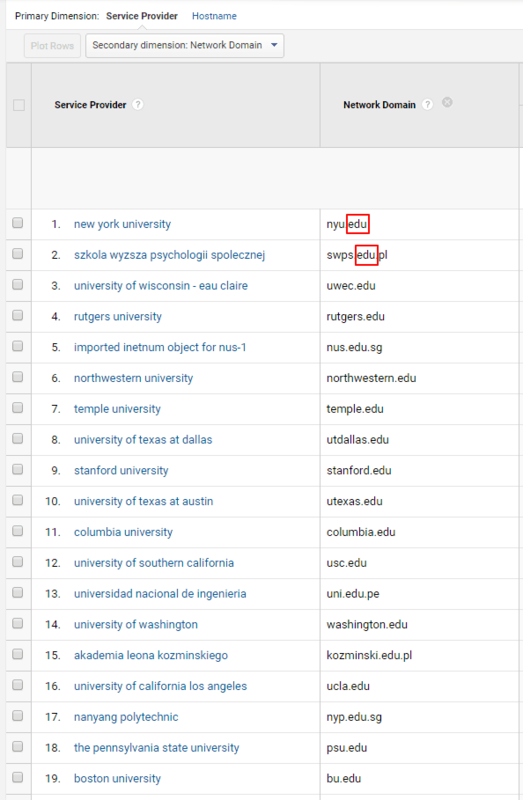 In this case, we’re using a RegEx filter to include Network Domains that have ‘edu’ in their values. This easily picks out colleges and universities and could be very helpful for sales teams focused on the higher education industry vertical. While not shown above, it is also often helpful to include a geographic dimension as the secondary dimension. The GA dimensions of Country, Region, Metro, and City can all be used in this way to provide additional details (e.g., for regional sales teams). Once we have a data set that is relatively free of ISP names and further filtered for ‘interesting’ names, it’s worth looking at the acquisition channels by which these visitors arrived at our website. 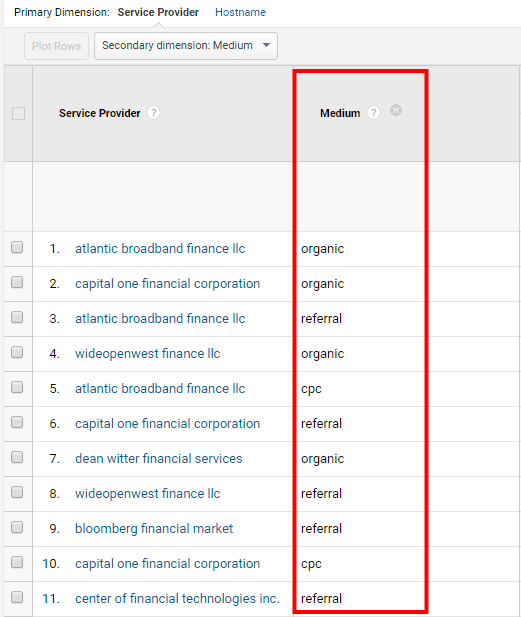 Below we see a breakdown for financial services visitors by acquisition channel, using the Medium dimension in GA. This additional layer of information helps us understand how these visitors arrived at our website. We also get a better understanding of which marketing programs are driving website traffic. For example, ‘cpc’ (pay-per-click), social, email, display ads, and similar campaigns can all be identified here, assuming proper campaign tagging is in place. So, everything above is already available in GA, ‘right out of the box’, as the saying goes. It’s certainly possible to manually use this data with other services, such as LinkedIn, Hoovers, or similar business databases to try to discover good contacts within these visiting organizations. This would typically be done by inside sales reps, business development staff, etc., to try to engage new sales prospects and get them into a buying mood (or at least agreeable to an opening conversation). Many of your prospects have common words or word variants in their enterprise name (e.g., the finance example above). Some industry verticals will be much better than others in this regard. It’s even better when sales teams have specific geographic assignments (which is typical). Then we can look at all of the above on a sales territory basis, which helps us focus even further on website activity that’s relevant to specific sales reps or teams. However, doing the above filtering, segmentation, custom reporting, etc., does require Google Analytics knowledge that goes beyond the basics. Not every B2B company has these digital marketing skills in-house. And even with solid GA skills in place, it can still be a manual effort to pull everything together in a way that’s highly useful for the sales team. So, how about adding more B2B marketing software to help out…? For many B2B firms, it makes sense to pay for a more integrated approach to identifying website visitors, vs. using only what’s available in Google Analytics. As noted earlier, these software solutions often go by different but related names: B2B IP tracking, IP lead tracking, B2B website visitor tracking, etc. As also noted above, B2B companies may be lacking the GA skills in-house to do the segmentation, filtering, reporting, and sales hand-offs described above. Or the target B2B enterprise customers may not be a great fit for the filtering approaches used with GA. For example, in highly horizontal target audiences that cover many industry segments with few specific keywords to target when building GA filters. And in many cases, the company may simply want a more integrated and automated approach that is more user-friendly for sales staff and that includes other features for the sales team (e.g., configurable real-time alerts). These products provide some of the functionality already built into GA to identify visiting enterprises, then add functionality aimed at efficient, informed, and timely sales follow-up. In some ways, they are a mashup of Google Analytics reverse IP, LinkedIn and B2B prospect databases, and customizable sales workflow tools. Note that the enterprise contacts presented by these tools do not typically identify the actual people who visited your website. They are merely good starting points for your B2B sales lead discovery and outreach efforts. So for large prospect companies with many individuals listed in contact databases, LinkedIn, etc., it will take additional refinement to know where to start. Refining by the geography of the website visitor is often a good starting point. These products typically provide many of the following features. Enterprise details – location, main contact info, website, etc. Known contacts from LinkedIn, etc. There are many vendors providing products with website visitor tracker functions. In some cases, their capabilities are available as part of larger Account-Based Marketing or marketing automation solutions (e.g., Act-On). I’ve listed several of the main vendors below. Follow the links below to learn more about each vendor. Disclosure: I have an affiliate marketing relationship with some of these vendors. I may earn a commission, at no additional cost to buyers, for purchases made via these links. I recommend considering these solutions for your B2B organization, regardless of how or when you may purchase them. I also donate a portion of my affiliate revenues to well-respected international charities and disaster relief organizations. Learn more about that here. Remember that these tools will probably not identify the actual individuals who visited your website. Just the organizations’ names, at best. The exception here would be in cases where the visitor is already identified personally by login info, cookie, or email address. Also note that Google does not allow collecting PII – Personally Identifiable Information – within GA data. These tools may only be able to map a fraction of your total website visitor population to actual organization names. If your visitor counts are rather low, and/or if you market predominantly to smaller businesses, these solutions may have limited value for you. I’d suggest first checking your GA Service Provider and Network Domain dimensions for the last 6-12 months to see what interesting enterprises show up there. For these reasons, you may want to go with a vendor that has a generous free trial period. 14-day free trials are common here, but you may be able to stretch that a bit further. Also look for user contracts that are easy to terminate with no hidden costs. See this related post about managing a successful free software trial for more tips in this area. And finally, while using these tools, be careful with any temptation to get overly aggressive with your follow-up tactics. To use a common analogy, don’t be like the annoying retail salesperson who basically pounces on people as soon as they walk through the front door of the store. Be helpful but also be sure to give your prospects the space and ‘breathing room’ they expect when doing vendor research on the web. Click above to open a related post on the vendors mentioned previously, including core product capabilities and intro videos. Account-Based Marketing (ABM) is all about treating specific target B2B customer accounts as ‘markets of one’ and then focusing significant corporate resources on those target accounts. Since many ABM prospect outreach programs involve attracting prospects to a website for further lead engagement and progression, we naturally want to have tools in place to help us understand which enterprises are visiting our website. So, this is where the basic function of B2B IP tracking comes into play in ABM scenarios. Visitor identification can be performed in a stand-alone way, or as part of a more complete, integrated B2B marketing solution. Success with ABM requires great planning and teamwork between the B2B marketing and sales functions. Good website analytics tools will certainly help with ABM efforts, but a culture of teamwork and shared vision + goals is essential. Disclosure: This section contains affiliate links to related books on Amazon. I may earn a small commission, at no additional cost to buyers, for purchases made via these links. I’ve reviewed these books and recommend them for B2B marketers’ consideration, regardless of how or where they may be purchased. As of mid-November 2018, these are the top 3 featured books on Amazon that are specific to Account-Based Marketing. Click on the thumbnail images to view the listings on Amazon. These two featured books on Amazon can really help boost your GA knowledge. Click on the book cover images below to learn more. These tools can be a very effective part of the lead-gen software mix in B2B firms. Used wisely and within a repeatable process, they can improve sales efficiency and productivity and also provide useful insights to the marketing team. Many firms use these software products as key pieces of their marketing technology stacks. B2B IP tracking features also play an important role in Account-Based Marketing programs. Adding this capability can help bring sales and marketing teams closer together, too. That’s a hot topic and certainly a big win for most B2B companies. For some companies who don’t quite need all the bells and whistles of these solutions, it may be enough to just use GA as described above for selective enterprise identification and also invest in a premium LinkedIn subscription for better prospect outreach features. The combination of deeper GA-driven visitor insights and targeted LinkedIn follow-up may be enough for some B2B sales and marketing teams. Have you used Google Analytics and/or 3rd-party B2B IP tracking products to help identify companies visiting your website? What do you like and not like about them? Are you using Account-Based Marketing ideas, tools, and processes in your B2B organization?